Grilling vegetables can be a great way to make and eat more vegetables. We have made a complete guide on how to grill vegetables. It covers what to do and what not to do. Which vegetables work great and which don’t and we’ve even thrown in a good recipe that will get you started. So let’s go learn how to grill vegetables. First things first, you need a grill. It can be gas, wood, electric or charcoal. That is not that important. What is important is that you can get it really hot as well as still keep a side where you can grill on lower temperatures. I have two grills, one for charcoal and one with gas. If I’m using the charcoal one I like to keep more coal on one side of the grill, and little or no coal on the other. That way you’ll get one hot side and one warm side but both will be hot enough to be able to grill vegetables. The same idea works with a gas grill, usually you can keep one side hot and one side warm. That is the basic setup and it works fine for me. 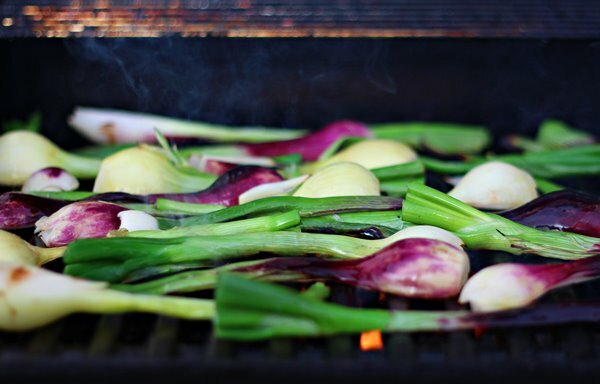 There are a few basic steps to grilling vegetables. Choose what to grill, there are many choices. Some things work great, some don’t. You can read more on this in the vegetable guide below. Peel, rinse and cut the vegetables. Most things need to be rinsed, cut and or peeled. Oil the vegetables. 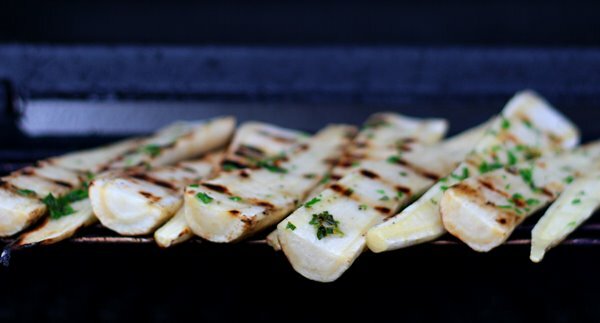 All vegetables need a bit of fat to be grilled in a good way. But it’s important to not use too much fat. Excess fat will drip down into the grill and start to burn. This will make the vegetables burn and taste like gasoline. Instead brush or spray a thin coating of fat on the vegetables. Add salt. Some say you should add the salt afterwards. I like to add a bit before grilling. It will taste better. You can of course add more once the cooking is done. Grill on high heat. Make sure you get some color on the veggies and they start to cook. As soon as they look good remove or move them to the cooler side of the grill depending on the vegetable. Check flavors and add more flavors if you want to. Most flavors should be added after you’ve grilled the vegetables. First grill them and once they are done you can add herbs, lemon, flavored oil, flavored butter or whatever you like. If you want to try flavored butter we have got a full guide to that as well. Then just serve them. What I often do is prepare the vegetables, brush them with oil and salt and then grill them. Then I make a flavored oil, with some chopped herbs, chili, lemon and garlic. Once the vegetables are done I brush them with a little bit of that oil. It makes the vegetables look better and adds a bit of flavor. If you would add a flavored oil from the start the herbs would probably burn so it is better to use it afterwards. There are lots of vegetables that are great for grilling and some that are not so great. Here are our favorite vegetables to grill and a few you should stay away from. Asparagus – The king of grilled vegetables. Use green asparagus and coat them in oil and add salt. Grill on high heat for a few minutes. You can read a full recipe for grilled asparagus here. Peppers – Cut them in big chunks and grill on high heat, this will blacken the skin and you will be able to tear it off. Grill until completely soft, grilled peppers that are not done will taste like a soft warm pepper and will make no guest happy. Fennel – Fennel or Anise which it can be called in the US is one of my favorite vegetables. Cut them in wedges and make sure each wedge is still held together by the core at the bottom. Brush with oil and grill on high heat for 2-3 minutes. Move to the cooler side and keep cooking for a few more minutes. 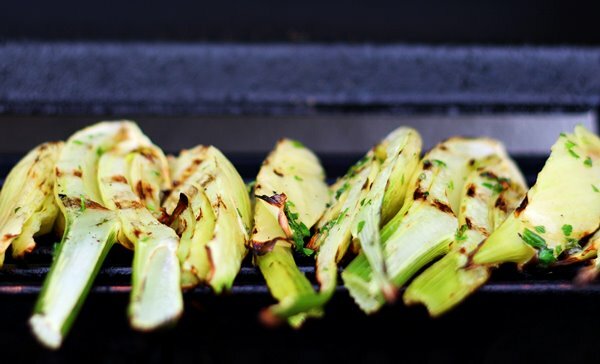 Fennel doesn’t have to be grilled all the way through. You can leave a bit of crunch in the middle if you want to. 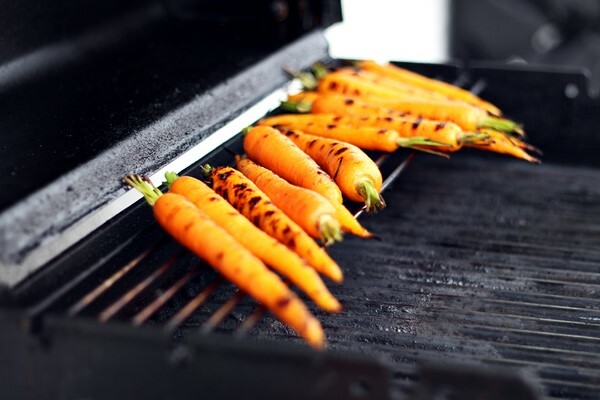 Carrots – Peel or scrub the carrots, brush with oil and grill on high heat until you get some black grill marks and coloring on the sides. Move to the cooler side and keep cooking until soft. 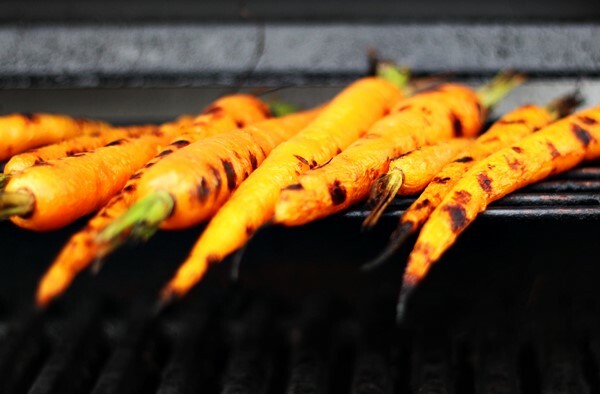 I like to grill my carrots until they are completely cooked through, some like the crunch but that is not for me. Corn – A classic, grill on high heat and add ridiculous amounts of butter. Doesn’t require much time on the grill. I prefer to boil the corn before grilling. Parsnips – Peel and grill, you the same technique as for the carrots. Parsnips are a bit dry and can use a bit of extra oil during the grilling. Just brush it on carefully as you grill. If the parnips are very thick you can cut them in half lengthwise. Sweet Potatoes – A great way to use sweet potatoes is to grill them, we have a full recipe for that here. In a few words you slice them in thick slices and grill them slow. Onions – You can grill onions in many ways. My favorite way is to slice them in ½ inch slices and simply grill them. Usually they will be done after 2 minutes on each side on the hot side of the grill. It is magic to add a full slice of grilled onion on a burger, it also looks amazing when you are Instagramming that same burger later. You can also grill fresh onions when they are in season, then follow the instructions for the scallions below. 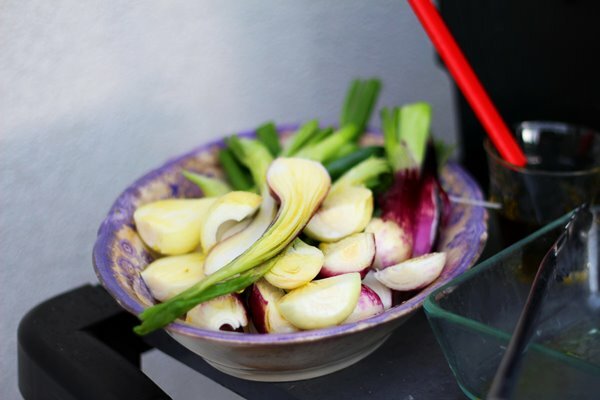 Scallions/Spring onions – Amazing to grill, use them in the same way as the asparagus. They actually work very good together. Grilled scallions and asparagus as a side for grilled meat or fish is a great side dish. 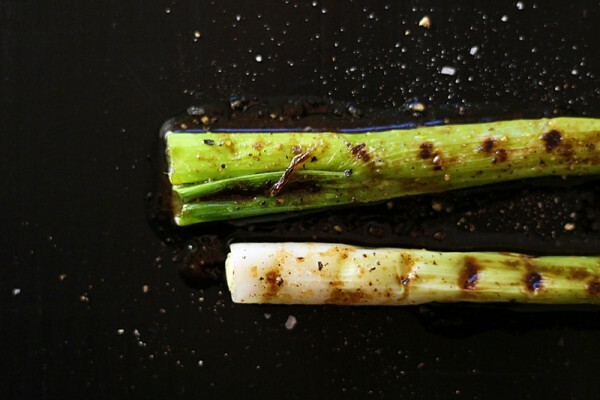 You can get a full recipe for grilled spring onions here. Salad – Yes you can grill salad. You need a salad that is crisp with thick leaves. My favorite is romaine lettuce. Get a head of romaine salad and cut it lengthwise in four wedges. Brush the cut side with oil and grill it for 30-60 seconds on the highest heat possible. Add to a plate and drizzle with olive oil, chili flakes, crumbled feta cheese and some black pepper. You won’t regret it. Aubergine – Many love to grill aubergine, I don’t get it. It gets ugly, soft and chewy. I prefer them pan fried in slices or smaller pieces. But if we are really being honest I rarely use aubergine for much besides ratatouille. A vegetable that looks way cooler than it tastes like. Mushrooms – Some people love grilled mushrooms, in my opinion they are just wrong. Sure it can taste ok but it will never beat mushrooms that have been pan fried with butter, garlic and thyme. That’s just the way it is. If you want to make a mixed grilled vegetable dish or side just pan fry the mushrooms on the side and then combine with whatever you’re grilling. Beetroots – Beets are to hard and dry, they are much better to roast in the oven or boil. Cucumber – Contains too much water, I’ve seen recipes for it but I don’t think they work very well. Zucchini – Very common to grill but I don’t like it. Much better to slowly pan roast. Cauliflower – A bit dry and hard not to burn. Also difficult to cut in a good way for grilling. But amazing when pan roasted, do that instead. Tomatoes – Can work but I rather oven roast them. Contains too much water. Anything to small – for it to be grilled it shouldn’t be too small. Bigger is often better when it comes to grilling. And most small vegetables work better in other ways. That is why I stayed away from things like snow peas and radishes. Consider yourself fully thought on grilling vegetables. To wrap things up you can try this recipe for grilled asparagus with parmesan cheese and olive oil. For the grilling remember that you are always the boss. If you think something I wrote doesn’t work or you’ve found a different technique you think work better then go with that. Good luck! Cut of the bottoms of the asparagus, if they are thick you might need to peel the stems, you can check this by taking a bite at the end of the asparagus. If the skin gets stuck between your teeth you’ll need to peel them. Best way to avoid this is to choose small thin asparagus if possible. Once the asparagus are trimmed toss them in one tablespoon of olive oil and season with salt and pepper. Then grill the asparagus on high heat on the grill or in a grill pan, they should be almost cooked through but still a little bit of bite. Once done remove from the grill and toss in the remaining olive oil. 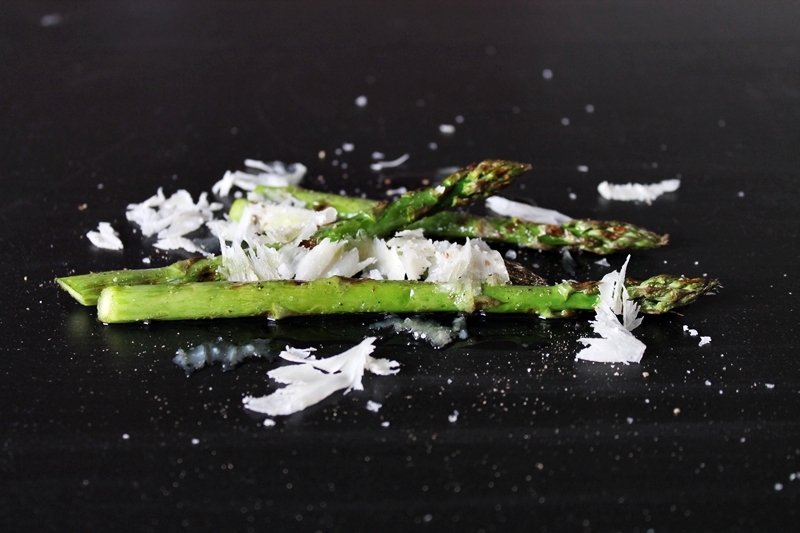 Add the asparagus to plates and sprinkle the shaved Parmesan cheese on top, serve. Good luck!